We’ll wrap up our whirlwind tour of the eight parts of speech in this post. So far we’ve covered nouns, pronoun, and verbs in the first post and adjectives and adverbs in the second. 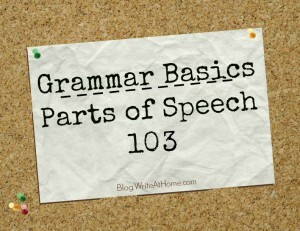 Let’s get to the last three: conjunctions, prepositions, and interjections. A conjunction is a word that connects words or parts of a sentence. There are three kinds of conjunctions, but we’ll begin by looking only at the most common – the coordinating conjunction. The most common conjunctions are and, but, or, and nor. Stan fired up the grill, and Henrietta prepared the goat for grilling. Vinnie wanted to spend the weekend ice fishing, but Gertrude insisted on a trip to Cleveland. You can set up the hammock, or you can sleep in the linen closet. Bill, Linda, and Jerome scored the highest on the scuba exam. I couldn’t decide to invite Edna, or Wanda. A preposition is a word that shows relationship between words. A preposition can show where something is located (in, on, near, over), the direction it is moving (to, around, through), or when it occurs (after, until, during). A preposition always begins a group of words called a prepositional phrase. The prepositional phrase is made up of the preposition and the object of the preposition (a noun or pronoun) and any modifying words in between. The following sentences include prepositional phrases (indicated in green). My daughter is dancing in the living room. Around the corner came a flamingo on a tricycle. Under the staircase lived a friendly troll. Ouch! That pan is hot! Well, if that isn’t the silliest thing I’ve ever seen. Oh, that’s my favorite kind of chocolate. Interjections can be fun, but be cautious about using them in formal writing. They are normally reserved for informal writing and dialogue. And that wraps up our first look at the parts of speech. We’ll come back to them in later lessons, because we only covered the simplest examples of each. If you can identify these, however, you are well on y0ur way to conquering the challenge of English grammar.